Aspiring martial artists are an enthusiastic lot. They have found inside themselves the capacity to dream. As one who takes the position that dreams are made to happen, I believe that making them come to fruition is our birthright. And as martial artists, particularly those who aspire to black belt, this vision is indeed special. To maintain your quest for the extra-ordinary, do not discuss your goals or aspirations with anyone. Other practitioners and family members would be excluded from this rule, of course. Invoking ego through discussion, or trying to impress others with grandiose boasting will automatically disempower your ability to manifest your dreams. "Inner growth... does not thrive on talk", wrote Draeger. An Eastern proverb states, Who so ever knows, speaks not. Who so ever speaks, knows not. Most of the qualified martial artists and instructors I know are generally quiet and reserved. It's likely that many of the people they interact with on a daily basis have no idea what they're involved in. In a memorable scene from the movie The Karate Kid, the main character is saved from a certan thrashing from the local karate bullies with the help of his neighbor, Mr. Miyagi, a now-revealed karate master. KID: You never told me you knew karate! MR. MIYAGI: You never asked. I've heard artists say the same thing: do not discuss your projects. I've thought of that too when I blog about the martial arts. Problem is I like to blog about them and tend to think things through better if I write them out. I also like reading other blogs that do the same and talk to other martial artists via the net. There has to be some Taoist balance I suppose. I guess I should cancel my blog. . . I think there's a balance though. There are those who talk about their goals because it means something to them. There are those who talk about their goals because they think it will mean something to others, as in they like to brag.
" Invoking ego through discussion, or trying to impress others with grandiose boasting will automatically disempower your ability to manifest your dreams." As for not discussing your goals, well, as it's been said by others here, the net is a whole other thing. I'm more outspoken around here than I am in life, honestly. Talking about what I want to do, or how I'm trying to do it, well I find that it helps me focus on it. Still, very good food for thoughts you gave us here. Thank you all for your comments. Writing and talking are not the same thing. There's a BIG difference between posting a blog that will be read by people who share a similar interest with you, and indiscriminately bragging about yourself to just anybody. Yes, talking "merely to show off" is clearly unethical. But it goes beyond that. One's vision or dream can be very personal. Be mindful of who you share your story with. I do not think that the idea of this posting is to prevent martial artists from blogging, but more, the warning is to remind us of humility. Blogging is a way of sharing accumulated experiences, questions, thoughts, aspirations, and mistakes. The people that come to share, and read get to know the spirit of the person typing through their words. They are encouraged to follow their own paths, and dreams by sharing in the paths of others. However, going around to all of our neighbours, co-workers, kid's teachers, and "bragging" about how I have achieved Black belt, and won the Grand international Championship will reveal just how little I value my own training that I would flaunt it like a blue ribbon at a fair. I place alot of thoughts on my blog, but I've noticed that there are only 3 special people in my life that I'm willing to share those very important dreams that I hold in the depths of my heart unrevealed to the masses. I'm new here, so please forgive me if I seem out of line. As a martial arts (MA) student for 24 years, I really enjoy 'humbly' speaking with other martial artists about their styles, techniques, and history. There's a kinship among us. As a shodan in two martial arts, I just consider myself a continual learner; nothing more. We should love to learn! And as far as "bragging" is concerned, it just leads to foolishness. 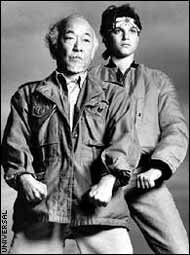 Didn't Mr. Miyagi also say his black belt was a K-mart special and just to hold up his pants? Classic. I agree 100% about not revealing your "mind work" and goal setting. It is a precept of (for want of a better phrase) magical workings. Although I discuss many things there's isn't a person alive today who has access to the written specific details of my goals. Message to hackers: don't try it, they're not written on my PC!